With the fall and winter months upon us, now is the time to do some routine maintenance around your home to prepare for the changing weather ahead. Taking the time to do some work now may save on some major expenses later on. Some of these tasks can be performed by you, and some may need to be done by a professional. Clear debris out of window wells, gutters, downspouts, and storm drains. Remove garden hoses from spouts. Drain and store for the winter. Wrap spouts in insulation. Check windows, doors, and siding for holes and cracks. Caulk as necessary. Check weather stripping on windows and doors for fit and condition. Replace as necessary. Inspect all soffit vents and other venting systems to make sure they’re clear of debris. Check painted surfaces for paint failure, water damage, or mildew. Repair or repaint if necessary. Check caulking where two different materials meet, where wood siding joins the foundation wall, at inside corners, and where the window and door trim meets the siding. Insulate outdoor faucets, pipes in unheated garages, and pipes in crawl spaces with materials such as rags or newspapers. Run all gas-powered lawn equipment until the fuel tank is empty. In doing this, you are removing flammable liquid storage from your garage. Make sure you aren’t storing dirty, oily rags in a pile. They can ignite! Remove bird nests from chimney flues and outdoor electrical fixtures. Have a heating professional check your heating system every year. Woodburning stove connector pipes and chimneys should be inspected by a certified chimney sweep at least annually. Make sure you have proper insulation in both your attic and basement. While checking your insulation, if you see any dark, dirty spots, it may indicate you have air leaks coming into your home. Remove hair from drains in sinks, tubs, and showers. Test all smoke alarms. Replace batteries as necessary. Check your home around windows and doors for air leaks. An easy way to check for leaks is to move a lighter around the window or door frame and see if the flame moves with a breeze. If you find a leak, you can caulk it or you may have to replace the wood frame. Repairing these leaks can save you money on your energy bill during the cold months. Check for water leaks in ceiling. Repair if needed. Make sure there are working nightlights at the top and bottom of all stairs. 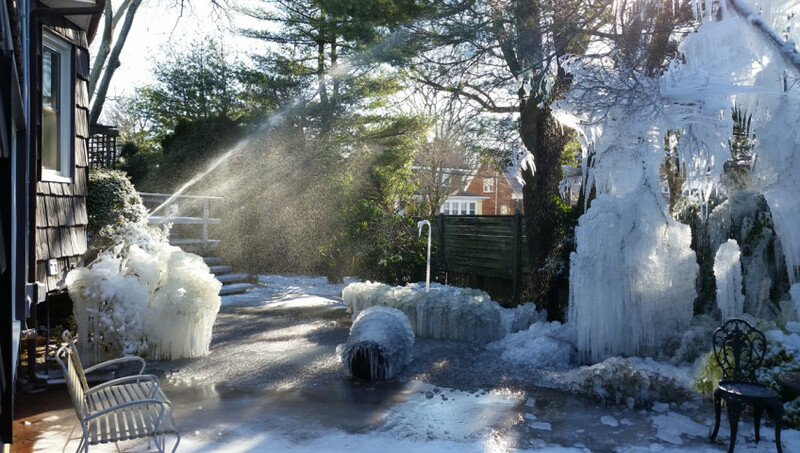 Protect your home from frozen pipes. See below. Inspect and clean dust from the covers of your smoke and carbon monoxide alarms. Make sure the caulking around doors and windows is adequate to reduce heat/cooling loss. Make sure that the caulking around your bathroom fixtures is adequate to prevent water from seeping into the sub-flooring. All stairs of at least three risers should have a handrail. Make sure you have enough wood cut and stacked to burn during the winter months. This will prevent you from running out and having to pay a higher price for it later. Always make sure you have a small stack close to your home to have quick access to if there is a lot of snow on the ground. When buying wood, make sure it is not “green”. Green wood will not burn. Make sure your snow shovels and/or snow blower are in good shape. Check your shovel handle for possible cracks or breaks and replace if needed. Have the routine maintenance performed on your snow blower. Review your fire escape plan with your family. If you don’t have a plan, create one! Winter is the season we spend the most time indoors and at home. Take care of your biggest investment, your family and your wallet this winter by following these quick tips on home maintenance and safety. Your heating system runs constantly throughout the cold winter months so it is important to keep it well-maintained to prevent needed repairs and also keep your system running efficiently. Remember to change out your HVAC filter each month. Replacing HVAC filters is crucial to keeping your air clean. Filters clean out pollutants such as molds, skin cells and allergens. Check the gas connections, gas pressure, burner combustion and heat exchanger to ensure safety and efficiency. Improper connections are a fire hazard and a dirty burner or cracked heat exchanger causes poor burner operation. Proper insulation of your home is critical to ensure proper heating and conservation of heat to make the most of your heating costs this winter. Inspect the insulation in your attic and crawlspaces. Warm air rises and leaves the house through the roof, so focus your insulation efforts on your ceilings and attics. Areas around recessed lights, the attic hatch and plumbing vents should be sealed as they commonly are the main issue in allowing warm air to escape your home. Storm windows help heat stay in and cold stay out. If you’re on a tight budget and do not already have storm windows, pick up an inexpensive plastic film sheet kit from your local hardware store. These only last one season, but help with insulation efforts. Weather-strip all doors that lead to cold or outside areas. Close curtains or shades at night and keep them open during the day, especially in rooms that receive a lot of light and sun. Re-arranging your furniture like couches, chairs, tables and beds away from any exterior walls makes your home seem warmer by putting some distance between you and the cold air. This also leaves room for the air to move around better, making it warmer. The cold and snow of winter can create hazardous conditions. Take a moment to plan ahead and prepare your home and family for the worst of what winter can bring. Stock up on sidewalk salt and sand (for better traction) and apply generously to all walkways and driveways at the first sign of slick conditions. Check your snow shovels for cracks or other damage. Have a backup shovel just in case. When shoveling, push the snow in front of you, if possible. If you need to lift a shovel-full of snow, pick up small amounts and lift with your legs, not your back. Do not toss snow over your shoulder or off to the side. Outdoor home care does not end when winter comes. Even in the cold weather months, your yard still needs maintenance to keep your home safe. Make sure tree and shrub branches are well away from the house and windows. Ice can cause branches to break and damage your home. Walk around the outside of your house and do a scan. Check the foundation for small cracks or openings where mice or other pests can sneak in. Seal up any possible entrances to keep these critters out. While outside, clear any snow accumulation off gas meters and away from basement windows and your dryer exhaust vents. A general check around your home, both inside and out, is important at the first sign of warm weather. In between exercising and playing with your kids, Spring opens the perfect opportunity to have your air conditioning and other mechanical systems checked by a home maintenance professional. Some of these additional tasks listed below can be performed by you as well, so take the time to spruce up your home for Spring because it will save you money and time over the season. Check for loose gutters, downspouts, shingles and siding or cracks in the sidewalk and driveway that need repair and cleaning. If shingles are missing, curling, broken or cracked they should be replaced. Gutters should be cleaned in the spring and again in the fall. Leaves and twigs clogging your gutters will prevent rain from draining properly. While cleaning your gutters, check for holes or rust and make sure they are securely attached to the house. Prune trees and bushes as necessary; clean away organic debris that has gathered during the winter. Pruning removes deadwood, improves shape and maintains the plants health. Test your deck for any boards or railings that need replacing. Maintenance to your walkways will help prevent guests and your family from tripping or falling. Take the time to examine all the wood carefully to see if any boards are rotten. Walk around your deck and listen for squeaks. Try to feel for soft spots or sagging areas. Inside the house check the pipes in the kitchen and baths for leaks that need fixing. Repair any dripping faucets or tubs. Check the shutoff valve at each plumbing fixture to make sure they function. Check your sump pump for proper operation and change the battery in the backup. A yearly cleaning is recommended before the rainy season hits. If you spot an oily film on the surface of the water in your sump pump, verify the condition of the oil seal. The appearance of oil may indicate a faulty oil seal which could cause the motor to burn out in the pump. Inspect and replace batteries in smoke and carbon monoxide detectors. Batteries weaken with age and should be checked regularly and replaced generally once a year. Give your kitchen range, hood and oven area a good cleaning to remove all built-up grease to prevent fires. Keeping this area clean of cooking grease will help keep a stovetop fire from spreading. Have a professional air conditioning contractor inspect and maintain your system as recommended by the manufacturer. Check around the bottom of your water heater to make sure there are no leaks or rusting. Replace it if you find any. If you have a fireplace, have it cleaned and inspected by a certified chimney sweep. Use Healthy Eco-Friendly Cleaners Many common household products contain toxins that could be affecting your family’s health. Buying natural safe cleaning products will help eliminate any risk of unnecessary toxins in your home. Curb Paper Towel and Napkin Use 2.5 million tons of paper towels fill up landfills annually. A great solution is to buy a set of cloth rags, bar towels and fabric napkins to wash and reuse. It may be an added expense up front, but it will pay off in the end. Replace Antibacterial Hand Soaps Studies have shown that antibacterial soaps are no more effective than simple soap and water. Antibacterial soaps can lead to stronger strains of bacteria that become resistant to antibiotics. Plastic— Just Say No! The Wall Street Journal reported that Americans go through 100 billion plastic shopping bags annually and making these bags requires an estimated 12 million barrels of oil. To reduce plastic bag consumption, use alternative options such as; reuseable bags, paper bags, or even, no bag at all! Replace the Sponge! Sponges are bacteria incubators. Although a sponge seems like a great cleaning tool, it may not be the healthiest solution. Replace your sponge with dish rags! Create a Recycling and Compost System If you don’t recycle, the best way to get into the habit is to set up a simple system. Get a second trash can for inside your home and put it next to the trash can and label it “Recycling”. If you are ready to take it a step further, composting is a great way to turn your waste into soil like material that can be used in your lawn and garden. Replace Nonstick Cookware Nonstick cookware releases toxins when over high heat, has a short life-span (nonstick coating usually wears out in a year or two) and the nonstick coating can scratch off into food. Healthy alternatives include stainless steel, cast iron, copper and glass. Buy In BulkBuying in bulk means less packaging and fewer trips to the store. You’ll also benefit from financial savings! Update Kitchen LightingKitchen lights are some of the most frequently used lights in the home. Energy efficient lights may be a high upfront cost but they use 75% less energy, generate 70% less heat and last up to 10 times longer. Buy ENERGY STAR AppliancesIf you are in the market for new appliances, choose one that has been proved more energy efficient. Many old appliances use a lot of unnecessary energy. If you don’t already have HWA’s Green Plus option— add it today!